Solid – Easily support a fully loaded CNC machine, power tools and several boxes filled with bolts and hand tools. 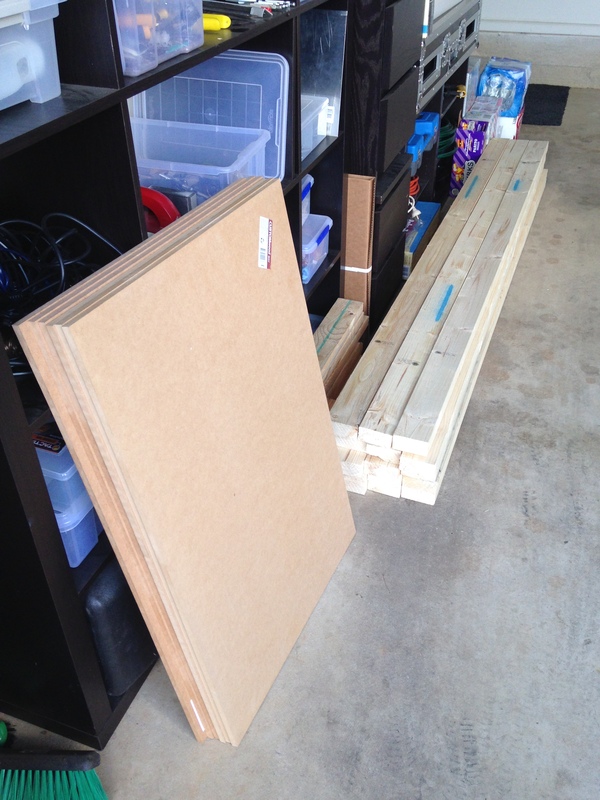 Big enough for a CNC machine – I can get 600mm x 900mm sheets of MDF from my local Bunnings so used this as a guide to the final size. Three of these sheets side my side would give me 1800mm x 600mm of bench space. 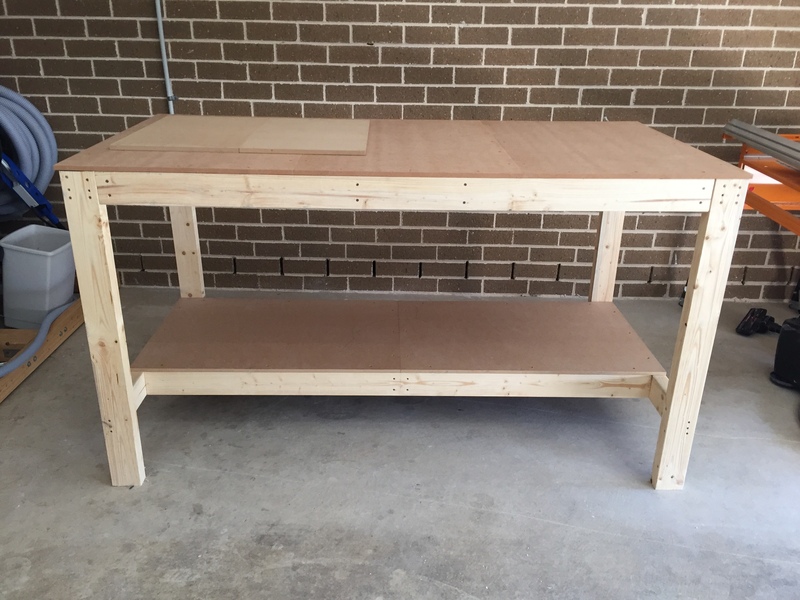 Cheap – My budget for the bench was no more than $150. This meant structural pine and MDF were the materials of choice. 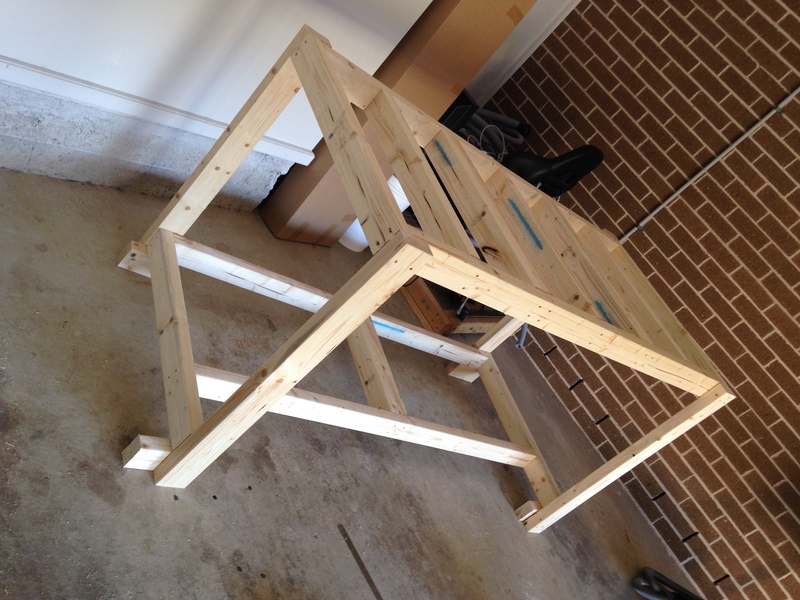 Customisable – The ability to modify the bench down the track was important. If I need to hang a tool I could just add a hook easily. 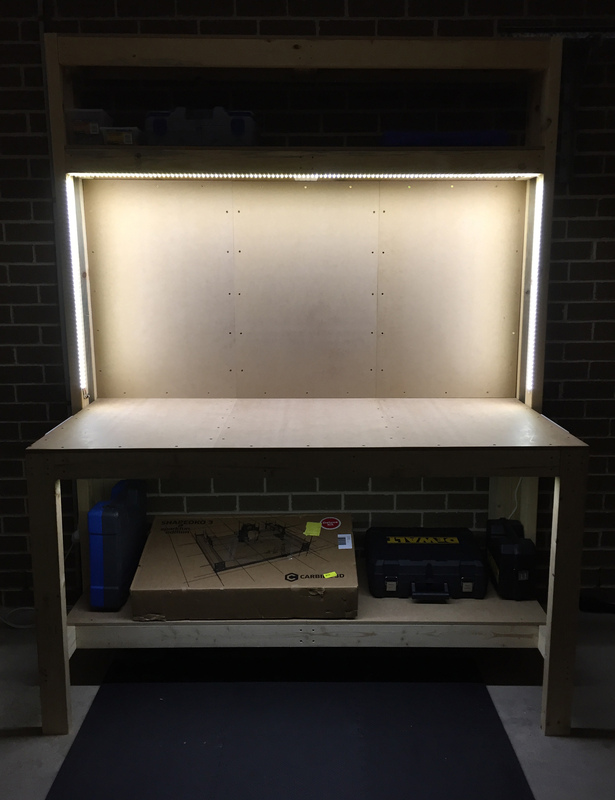 Well lit – Enough lighting to easily see what I’m doing as well as shoot video and take photos of my projects. Comfortable – I’m sitting all day at work, so wanted to try a standing desk. I’m about six foot tall, so wanted a bench height of around one meter. I also wanted some nice flooring that I could stand on to get my feet up off the concrete. Why not just buy a bench? I wanted the bench to me mine – built to my exact specification. I started the process by researching existing bench designs. I really liked this design which looked like something I could build easily, and would scale easily to my space requirements. Top – Made from three 600mm x 900mm MDF sheets. Total area: 1800mm x 900mm. This area will be my main workspace. Bottom – Made from two 600mm x 900mm MDF sheets. Total area: 1800mm x 600mm. This area will be for storage of tool boxes, and my vacuum. 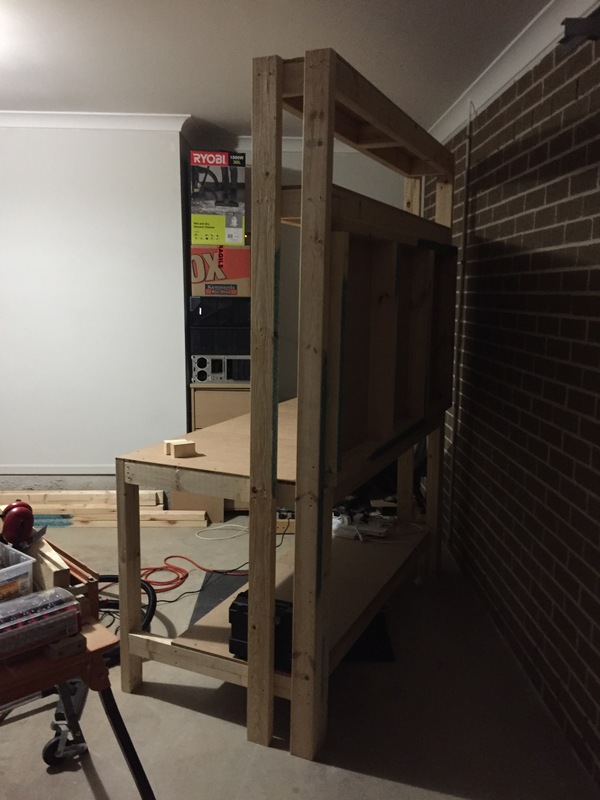 Shelving – Made from one 600mm x 900mm MDF sheet cut in half lengthwise. Total area: 600mm x 900mm. 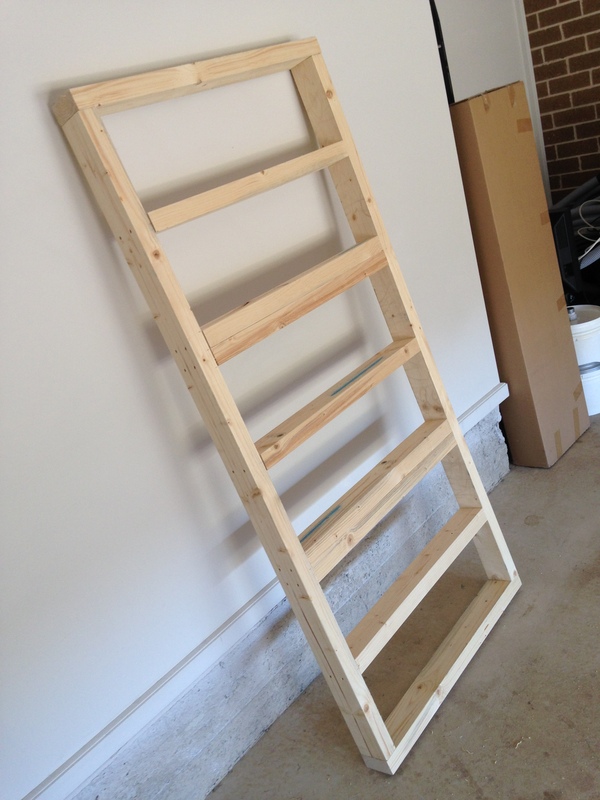 I’d be making two of these shelves. This stage consisted of some very crude sketching on paper, and working out how long I’d need to cut my pine. 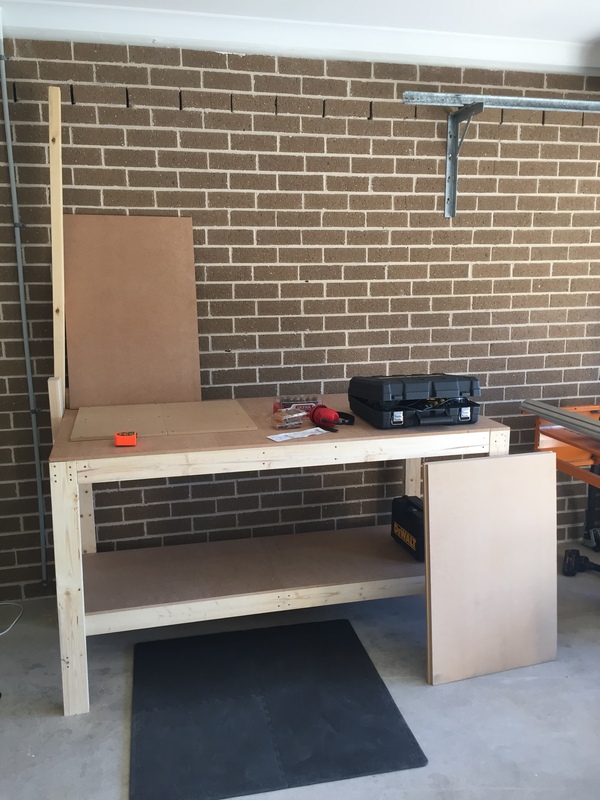 Given the width and length of each work area was known, this was just a matter of working out how tall to make the bench and working backwards. 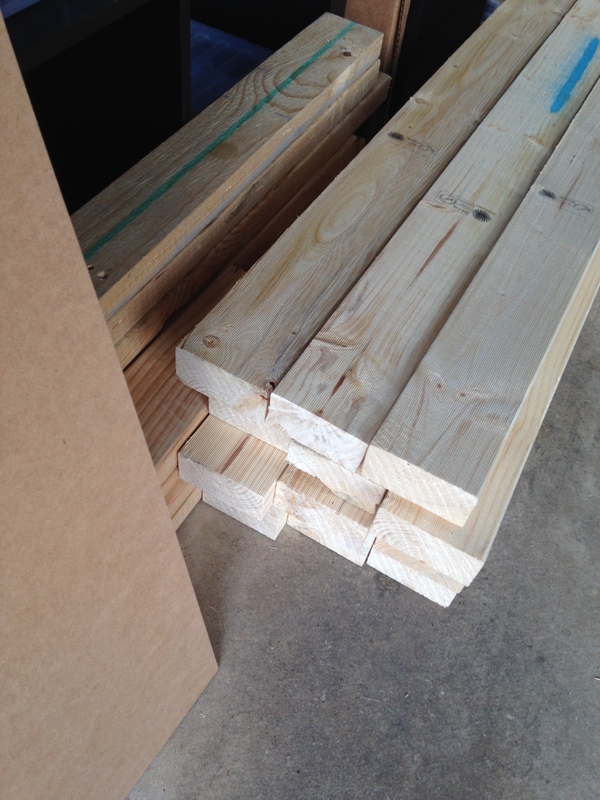 16 lengths of 2.4m x 90mm x 45mm structural pine. I wanted this to be strong. 10 sheets of 600mm x 900mm x 12mm MDF. Several hundred 60mm self-tapping chipboard screws. 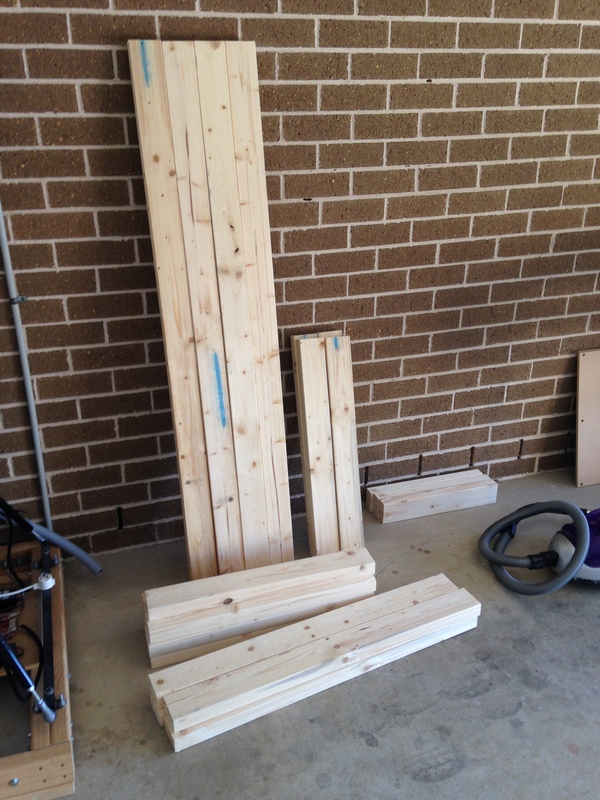 I drive a station wagon, but even that wasn’t large enough to safely transport 16 lengths of pine, so I made two trips. Conveniently, my local Bunnings is just three minutes down the road. With my design planned out and my cutting list ready to go, it was time to cut some pine. 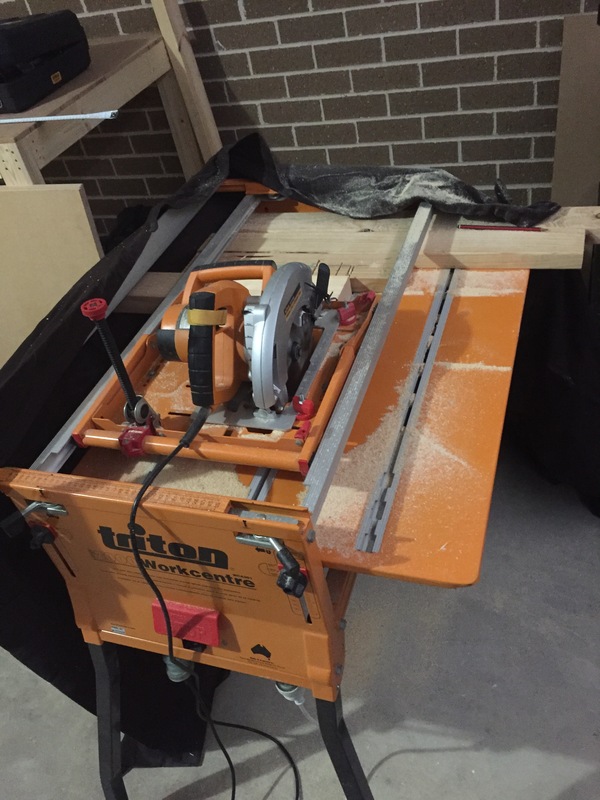 My trust Triton workbench was up to the task – configured in ‘drop-saw’ mode, the bench made cutting of the pine to length pretty straight forward. I couldn’t imagine doing this with a hand saw! 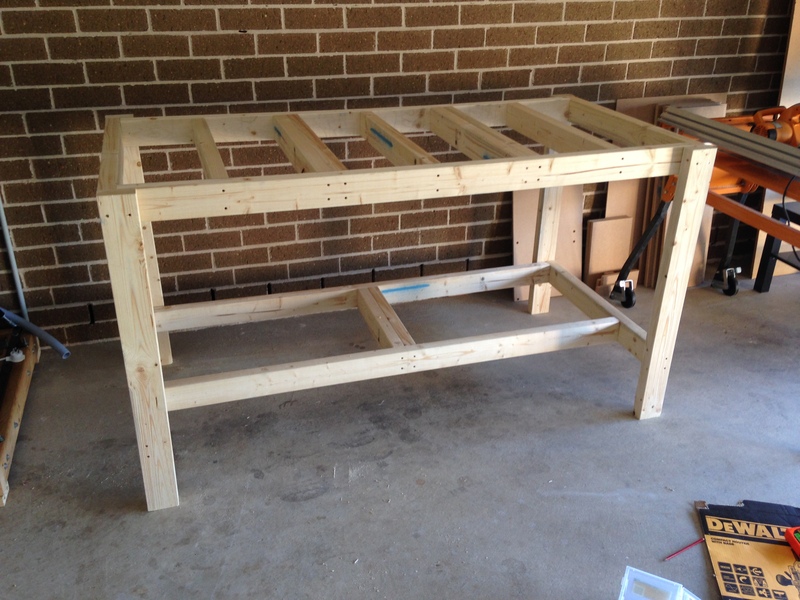 The actual construction of the bench was probably the easiest part. With my wood already cut to length and carefully measured, this step was a matter of just screwing the front and side pieces together, and getting the noggins (the middle support pieces) in the correct place. 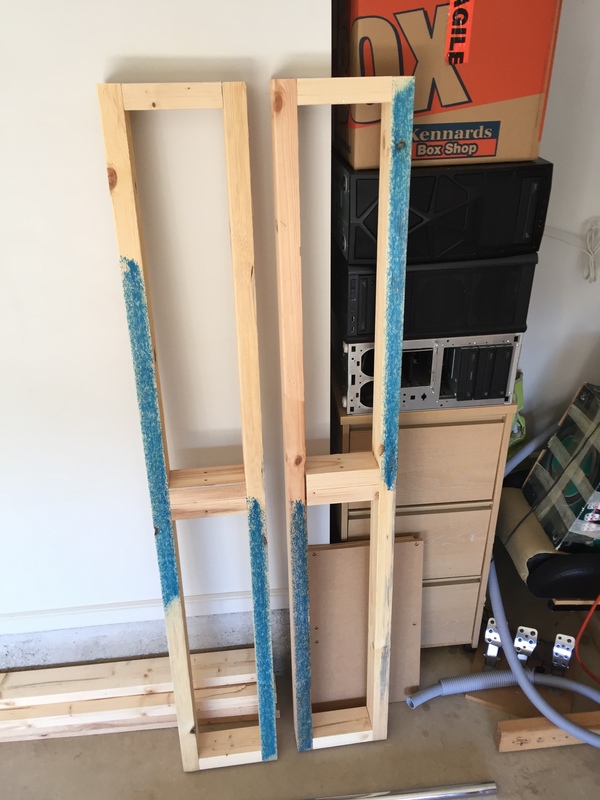 You’ll notice in the first picture I’ve got double noggins – this is so I can easily screw the edges of the MDF sheet to the frame easily, and to add a little more strength to the top surface. The bottom surface is recessed by 300mm to allow standing at the desk without bashing my shins. A quick run around the outside with a flush mount router bit (not pictured) brought the top surface to the correct dimension. With structural pine coming in standard lengths of 2.4m, I used this opportunity to just add another shelf at the very top of the bench. This seemed like less work then having to cut the 2.4m lengths to size. This decision required a little more cutting (and another trip to Bunnings) but I felt it was a good time to make that adjustment. You can see from the last photo that the bench is very tall. 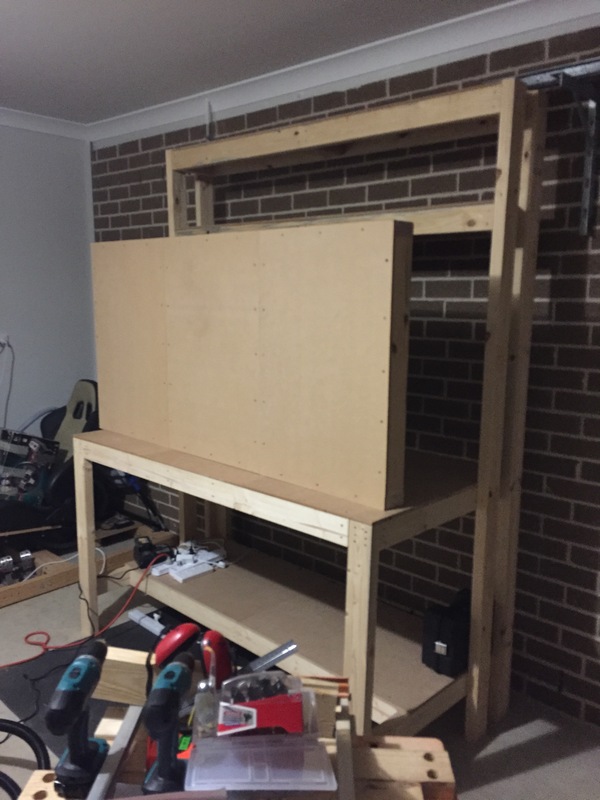 The top shelf is unreachable whilst standing at the front of the bench, so it’ll be mostly used for storage of lesser used items. You can also see the black ‘rubber’ flooring that I’ll be using. This stuff is pretty cheap at around $10 to cover one square meter. I bought eight packs which should be enough to cover the majority of workspace underneath my feet, as well as make a path to the interior garage door into the house. I had a few problems with this stage of the process. I could have just screwed two lengths of pine to the back and called it a day, however I wanted something a little more ‘robust’ that would reduce the amount of lateral flex that the desk was experiencing from the sides. 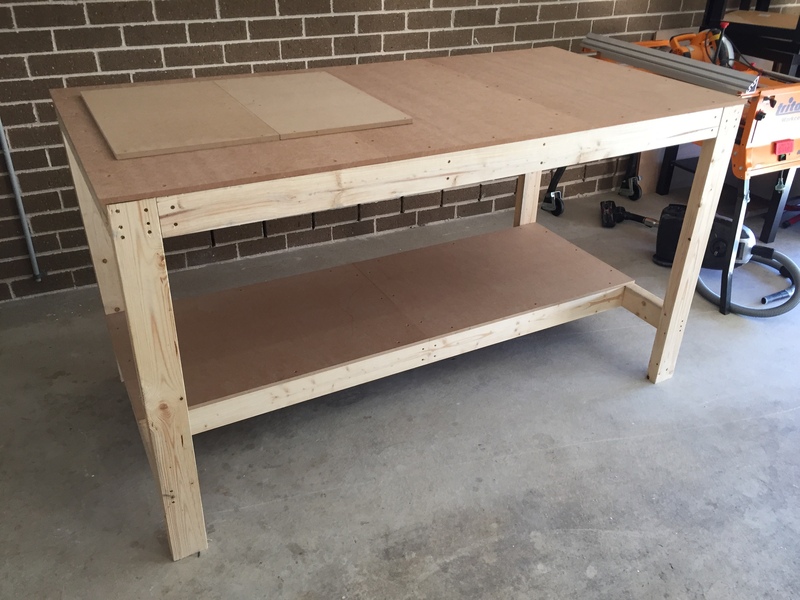 I decided to just duplicate the top of the bench and made another 1800mm x 900mm frame, complete with MDF panels. This did take a while and I was itching to get started on my next project, however it was now or never. This reduced the amount of lateral flex in the bench considerably, however significantly added to the weight. 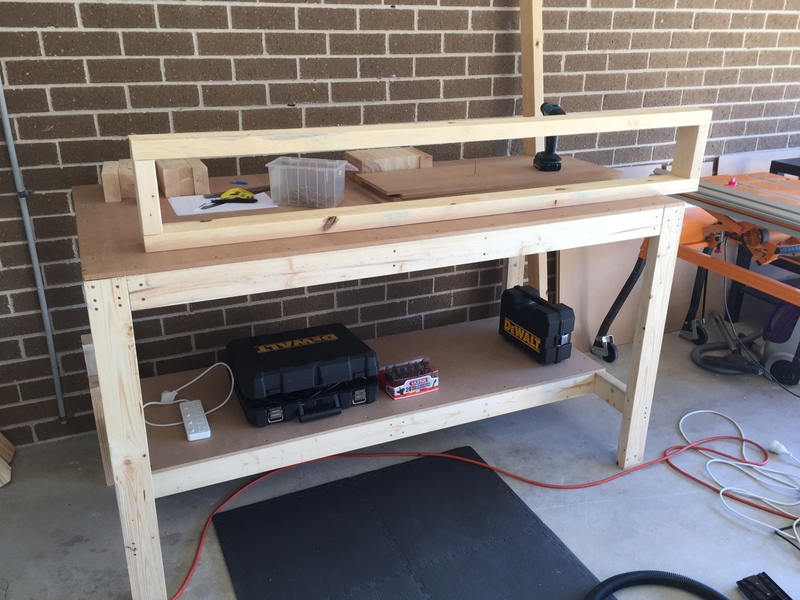 For powering the bench I simple screwed 2 x 4 outlet power boards to either side of the bench. The power boards I used also have surge protection as well as 4 1.5A USB ports which may come in handy down the track. 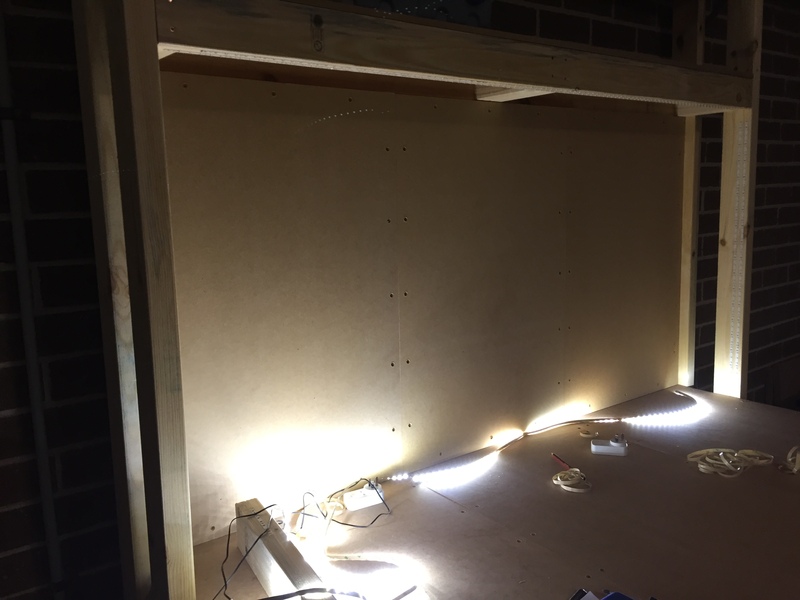 For lighting, I first brought an LED florescent housing, however I returned it to Bunnings after realising I’d need an electrician to install it. No thanks. 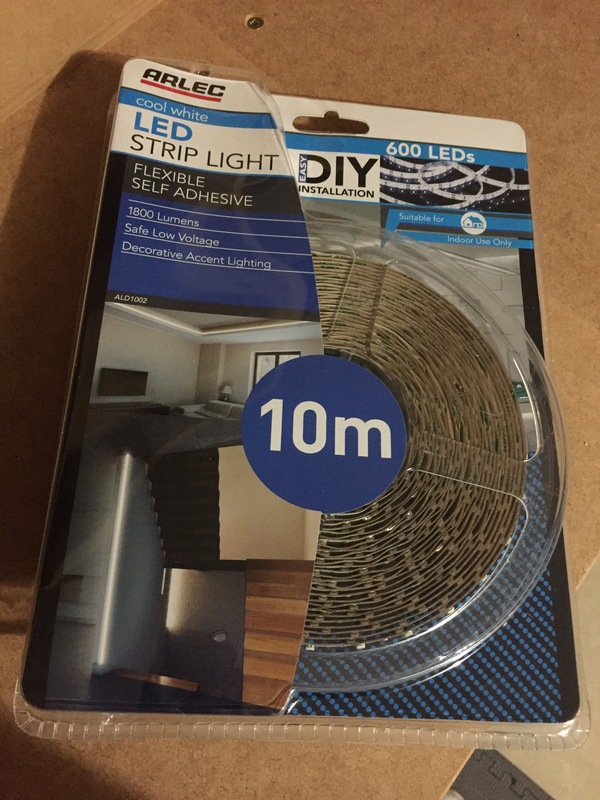 The LED strip lighting I settled on wasn’t cheap at around $75. 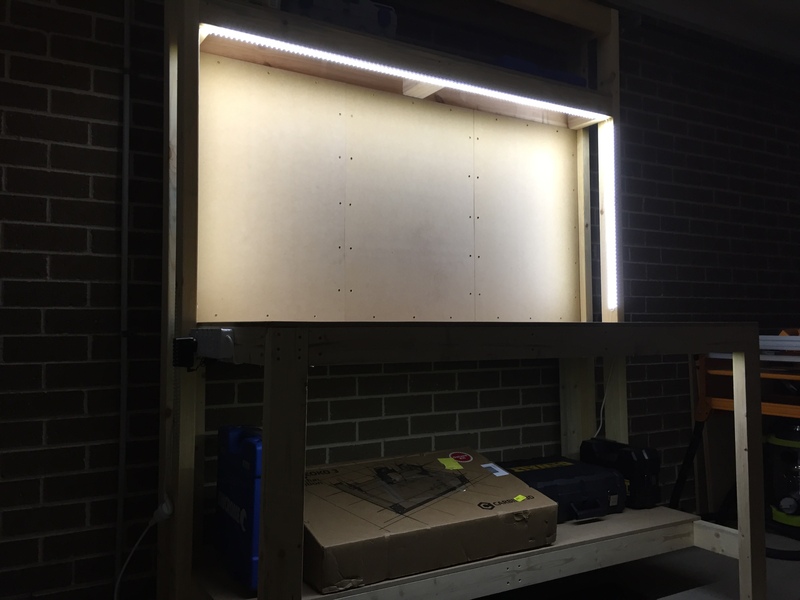 However it’s extremely bright and 10m was enough to install two rows around the inside of the top surface, as well as some lighting in the storage area underneath. 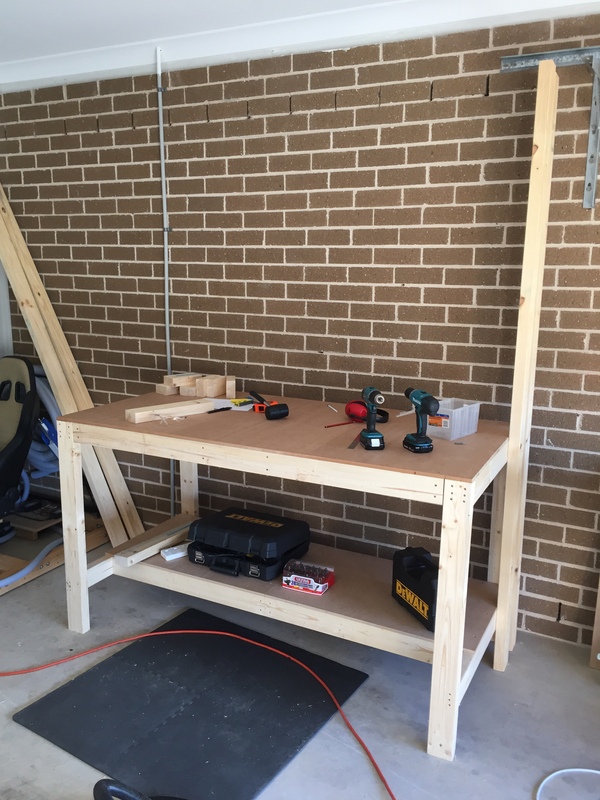 After a few weeks of work, several hundred dollars in materials, and more than a few trips to Bunnings, the workbench was complete and ready for action. 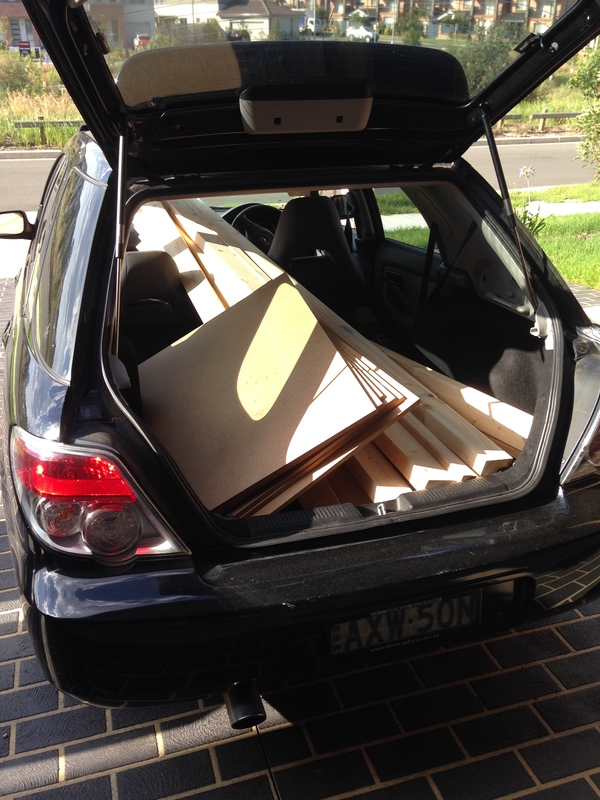 Pre-cut sheets of MDF will be oversize – Some sheets I brought were up to 6mm oversized in both dimensions. 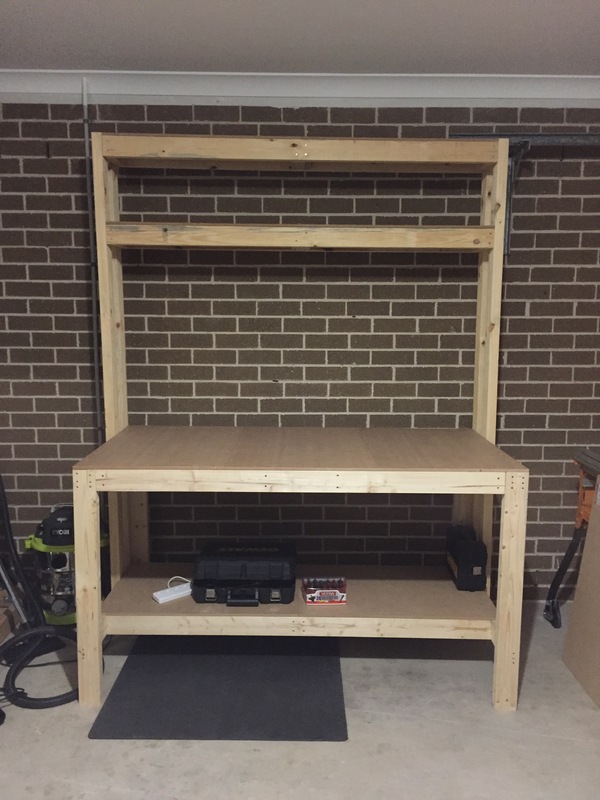 I needed way more screws than expected – I went through around 200 screws in the construction of the bench. Two drills makes this easier – One drill to drill the pilot holes and one to drive in the screws. Not such a problem with the pine, but for the MDF this sped up the process considerably without having to change bits every few holes. 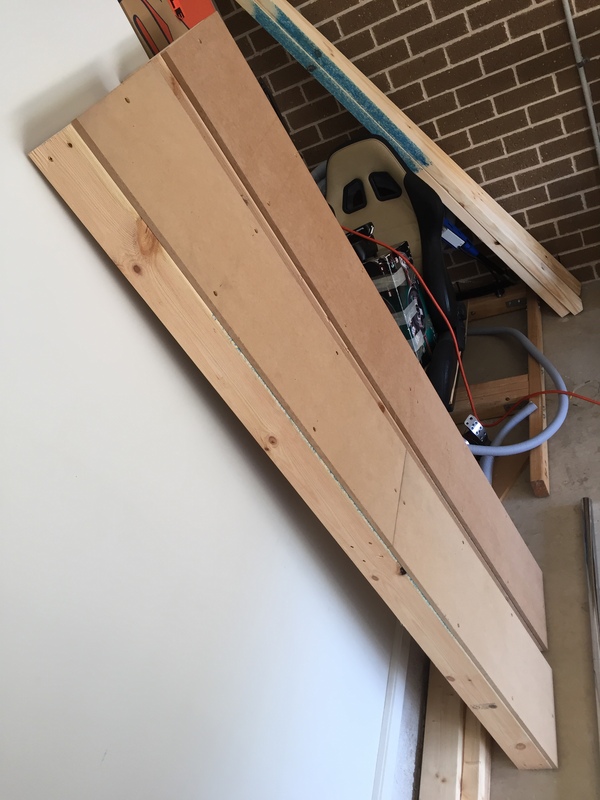 I could have saved time with a single 1800mm x 900mm sheet – I’m not convinced this would have fit in the back of my car but it would have reduced the amount of screwing and measuring required for both the top and back panels. Soldering upside-down is hard – Soldering the LED lighting strip lengths together after installing them was a poor decision. A hosted WordPress blog is awesome – I’m extremely happy with the hosted blogging process thus far – especially the way hosted WordPress handles image uploads and gallery generation. This resonates well with my desire to spent less time managing the blog and more time making. 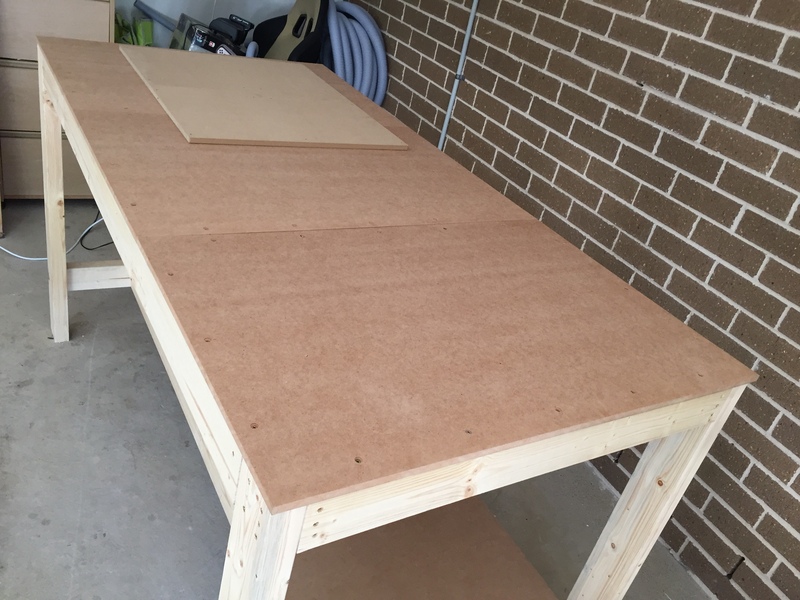 My workbench is now ‘complete’ and is ready for the next project, the Shapeoko 3 CNC machine. 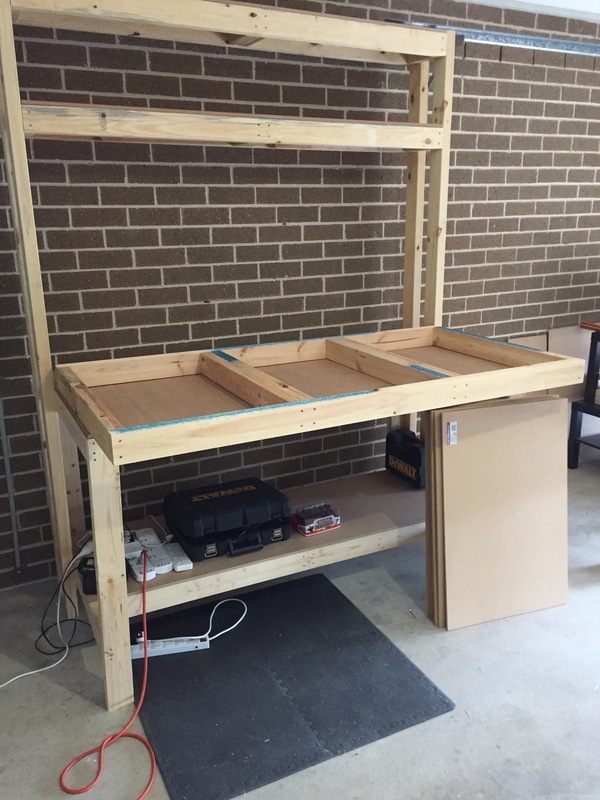 Previous Previous post: LukeLabs has a new home!